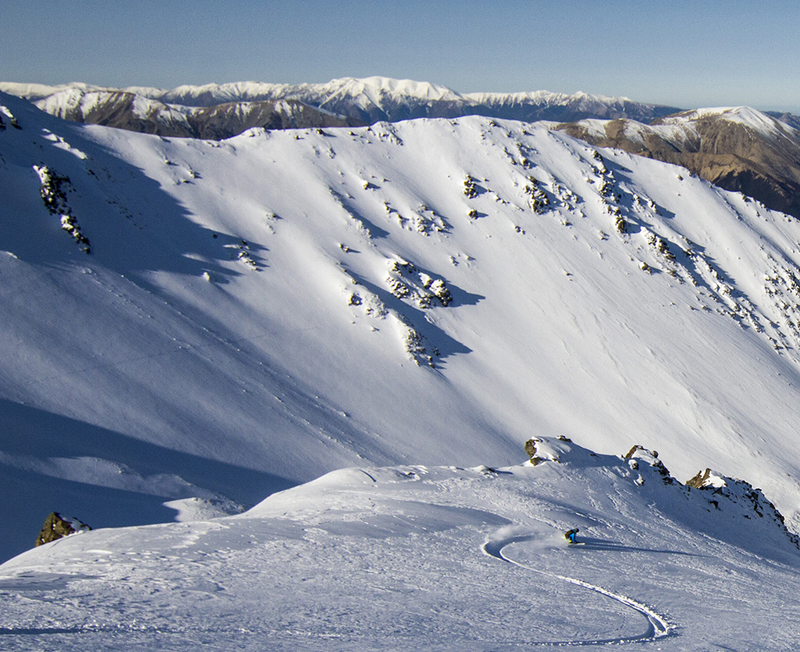 This is a lofty claim, and while I haven’t used them in North America yet, I have spent much of the last week skiing them in a wide variety of conditions in the Craigieburn Range of New Zealand. On our second day in New Zealand, I switched to the BMT 109 for some lift-served riding and ski touring out of Porters Ski Area. After taking them out of the ski bag, I’d immediately noticed that the bindings did not appear to be in the right place relative to the mounting plate (we received the skis mounted in this way from Volkl). This is pretty obvious on V-Werks skis, since the mounting area is the only flat, full thickness part of the ski, and our bindings were at the very front edge of this section. Based on a quick inspection, it appeared that my boot center was a little over 3cm forward of the recommended line marked on the skis even after I maxed out the rearward movement on the Kingpin 10 demo bindings. I had to ski them one more day in this position before I had the opportunity to remount them. Where relevant, I’ll comment on my experiences with the forward mount (+3cm) and the recommended mount. The flex of the 186cm BMT 109 is relatively even with the tips being more in the medium+ category and the tails slightly stiffer. 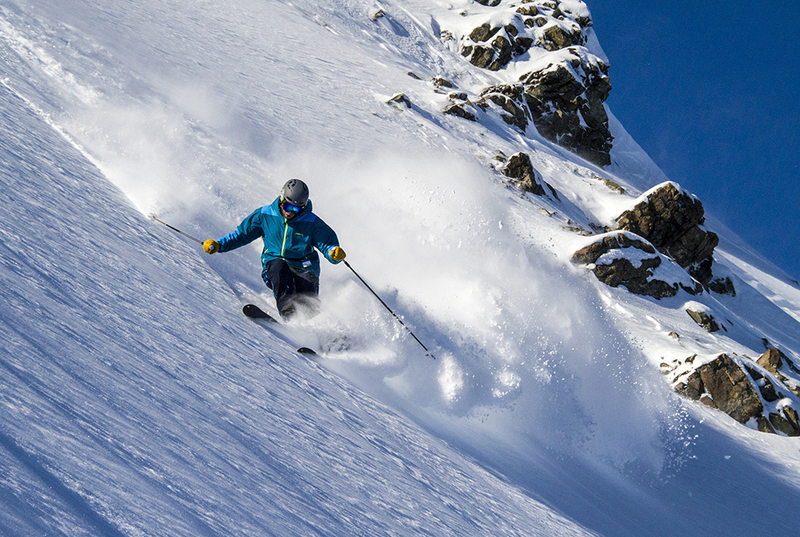 Ie, it’s not among the stiffest ski we’ve tested but it’s certainly not soft by any definition. My first runs on the BMT 109’s were inbounds at Porters Ski Area on firm, chalky cold snow while skiing them at the +3 mount point. It only took a couple of turns to notice how the tips engaged smoothly and predictably into the turn on firm snow. While this was exaggerated by the forward mount, it was still true of the skis in the same conditions later mounted on the recommended line. I think a primary contributor to the smooth, easy turn initiation is the BMT 109’s long, low continuous rocker. This proved to be true regardless of turn shape or point of initiation. In tight chutes with jump turns, I could land on the front of the ski and smoothly engage the edge into a very confident turn on hard snow, but could also decrease edge angle into nicely controlled skids while still feeling like I had most of the 186cm supporting me. Paul Forward on the Volkl V-Werks BMT 109. Similarly, on open slopes, while making bigger turns that matched the 26m sidecut, I could bend the ski into the top of the turn with smooth easy engagement of most of the effective edge. As long as the firm chalky snow was relatively smooth, the BMT hooked up easily and inspired confidence regardless of turn size. Interestingly, the BMT 109 has an almost-pin-tailed shape based on Volkl’s reported sidecut of 134-109-119. In the past I have not found pintailed skis to be the best option for me in firm conditions (whether smooth or bumpy) as they tend to lose traction and wash out. I did not feel like the BMT 109 exhibited any of these negative characteristics. Instead, they were able to cleanly finish turns with steady edge and good control. While the BMT 109 has a great shape and an even flex from tip to tail that I enjoyed in smoother snow surfaces, I found them less capable when the snow got bumpy and firm. No ski makes refrozen slop / coral reef-like conditions fun, but the low weight of the BMT 109 allows it to get tossed around a bit more than other skis I’ve used that have more mass and a damper fiberglass and / or metal construction. That said, the BMT 109 is surprisingly damp given it’s lighter weight, especially considering that I was skiing it with a tech binding (Marker Kingpin) and a touring boot (Salomon MTN Lab). This combination of relatively damp lightweight skis is something that has been high on my ski-industry-wishlist for years, and it’s great to see several manufacturers that seem to be looking for this as well. We had a nice 10-20cm refresh during our time skiing the Canterbury club fields, and I skied both fresh and windblown powder conditions on the BMT 109. The smooth, elongated rocker profile planed up on top better than expected, and it was among the better skis in this width class that I’ve used. The BMT 109 would easily roll into a long, drifted turns, but also made angulated carved turns across the fall line in soft snow. Overall, this is a super fun powder ski for it’s width. In my opinion the compromises (increased rocker, softer flex) that would have to be applied to this ski to make it ski powder any better at this waist width would not be worth the loss in performance in firmer conditions. NEXT: Breakable Crust, Soft Chop, Etc. Cheers for the review, I’ve been thinking about this exact ski/binding combo for a while now so it’s super helpful. Despite alot of searching, I’ve struggled to find much info as to how the Kingpin holds up inbounds/in resort. I’m 6’2″ but only 150lbs (plus ski gear) so I’m not worried too much about pre release, but I’m coming from skiing Griffons and Guardians so I’m concerned about harshness in resort, and also about being worried that my ski won’t release in a crash. Do you have any comments about how this setup, especially the Kingpins, would suit me? I ski mostly French alps, especially the Chamonix area, and would probably use them about 30/70 in/out bounds. I’d rate myself as an advanced skier looking to move away from frame bindings and get into the back country more, but who may stilll have to use this setup in resort from time to time. Hi Tim, We’ll do a full review of the Kingpin on the site that will address your questions. For now, I would say that I think you will find the Kingpin 13 to be a great choice for what you’re describing. Let us know how it goes. It’s been a great binding for us thus far. Excellent review! Can’t wait to read the deep dive on the BMT 109, the Blizzard Zero G 108, the BD Carbon Convert as those three (including a DPS Wailler 112) are on my list for a new dedicated touring ski for this season. I became a member yesterday for this specific one ;) but in reality I have been using your site extensively for many things, including my boots selection (Cochise 120) and Liner (Intution Pro-tour) … so I figured that’s the least I should do, support the people who spent a lot of time putting good, VERY useful reviews! Great work as usual !!! Thanks for the review and for your site! I demoed the BMT 109 176 with Kingpin bindings a couple of days ago in Australian spring snow conditions. I have to say I’m lusting after this set up. They were really fun. A little chatterey at high speeds but nimble and carved pretty well. Just wondering whether you would go for these or the V Werk Katana as a touring/one ski travel quiver for Japan. I’m an advanced intermediate skier but “progressing rapidly” as someone else put it and want a ski I can grow into. I’m 6’0 85 kg and ride 83 cm RTM 84s. These would be my second ski. I’d probably get the 186 BMTs. They didn’t have it available in demo though. Hi Paul, Thanks for kind words! For a one ski quiver that will still serve well in Japan I think I’d go for the Katana. It feels quite a bit bigger than just a few mm underfoot and I think it would serve well in the pow while still being fun at home in Australia or New Zealand when it’s not as deep. If I was buying a ski just for Japan I’d go fatter. Thanks for the review and for your site! I demoed the BMT 109 176 with Kingpin bindings a couple of days ago in Australian spring snow conditions. I have to say I’m lusting after this set up. They were really fun. A little chattery at high speeds but nimble and carved pretty well. Just wondering whether you would go for these or the V Werk Katana as a touring/one ski travel quiver for Japan. I’m an advanced intermediate skier but “progressing rapidly” as someone else put it and want a ski I can grow into. I’m 6’0 85 kg and ride 183 cm RTM 84s. These would be my second ski. I’d probably get the 186 BMTs. They didn’t have it available in demo though. Thanks for another great review. I’ve been considering the BMT 109 but my curiosity is now piqued by Blizzard’s Zero G.
I have a line on a pair of BMT’s, but hoping to hold off until the Deep Dive, comparing the two. Any idea when that will be out?? Thanks BK, I don’t know when that particular Deep Dive will hit the site but it’s one that we’re definitely excited about. Both are great skis and I don’t think you’ll be disappointed with either. Thanks for writing in and helping motivate us to get the stuff up on the site that you are excited about! Thanks for review, I have the guardian 16 Salomon binding and I wonder is it a right choice to mount them on BMT 109? Curious how similar this will be to the new Volk 100Eight, and if it has similar characteristics, but if the 100Eight is more inbounds focused in some way, although the lengths don’t quite match up. Interesting question. My (rather fast & loose) understanding is that the 100Eight / 90Eight were created as a less expensive alternative to the V-Werks construction. So “price point” seems to be the primary story rather than “performance difference” — though that does not negate your question: assuming the 100Eight is a bit heavier, it may well peform better / be the better choice for someone looking for more of a 50/50 setup. Not sure that we’ll be reviewing the 100Eight / 90Eight soon, but who knows – perhaps I should learn my lesson and not sleep on these skis as I did the V-Werks line for a while. Hi Jonathan, I’d second your comments on reviewing the Volkl 100Eight. I love to see a review of the 181CM. Man, that BMT 109 is drool-worthy! I have been looking into 100-110mm waisted touring skis for the PNW that can handle all of the variable conditions you get when descending 5,000 ft. Your reviews of the BMT 109 and Zero G 108 have been most helpful though I admit I am a cheapskate and didn’t buy in to the Deep Dive comparison. One other ski in this class that caught my interest is the 2015-16 Moment Underworld. Is this ski on your review radar? Not much has been said about it on the interwebs but Moment seems to consistently make quality skis that function very well for their intended purpose (the Underworld’s purpose being “a playful mid-fat touring ski that excels in both epic and laughably miserable conditions”). Looks like it could be a contender. Also, do you have a Dynafit Radical 2 or Diamar Vipec Black on the horizon? I’m sure you could fill a couple pages of a Gear 101 explaining the new breeds of tech bindings but on the surface these bindings appear to give the Kingpin some competition in the pin-bindings-that-ski-like-alpine-bindings category! Thanks Dylan, Sorry it took so long to get back to you. somehow this one slipped past me. For sure reconsider checking out the deep dive and upcoming buyers guide for good info on a bunch of the skis you mention. We have not been on Underworld’s yet as far as I know but I bet that will change this season. Hopefully you found our reviews of the new black Vipec helpful. Have a great season! If you had a two ski quiver, how would the BMT 109 work as the soft snow ski for powder touring and resort powder days? I’ve got a Fischer Motive 95ti for firmer conditions or low snowfall but want a new touring setup that I could take as my only travel ski for going to UT, WY, and even Chile. Could the BMT 109 fill that role? Thanks Paul! I should have mentioned I live in Montana and ski soft light snow a lot. I definitely would mount them with a kingpin. I’ve got a pair of Liberty Double Helix that I love but I actually prefer fewer skis, not more, and I would replace the DH and current touring setup with the BMT. Can’t wait to try it. Given the type of snow that you ski and that you are wanting a 2 ski quiver, I would look at the BMT 122. Little bit wider but likely better for light powder days. Check out the blurb on it in the Blister Buyer’s Guide. There are some crazy good deals on last year’s BMT 122 right now. I have the BMT 109 (176) as my only touring ski and love it for one ski quiver use on heavier pacific coast snow, but its not outstanding on our “powder.” The 186 would likely be a little better. Thanks Michael. I found a screaming deal on a 109 and jumped on it. I was in Mexico for most of the last month so haven’t had a chance to ski them yet, but although I plan to use them as my powder ski inbounds as well, I prefer to not go too wide for my touring ski. I think 122 would be hard to traverse with on steep firm slopes, plus the people I ski with are all on closer to 105 widths and I want to fit into their skin tracks! I’m sure you are right that for skiing light powder I’d prefer the 122. Hopefully the 109 will work pretty well too. I had to prioritize touring over pure powder. Right on Greg. I think you’ll be pleased with the 109. The 122 does fine on firm snow skinning and skiing but the 109 is definitely more versatile. Have a great winter and let us know how it goes. I’ve finally gotten a number of days on my 186 BMT 109’s and I couldn’t be happier! Mounted with Kingpins they are light enough for my touring but still stable and strong enough for inbounds. What I like is how amazingly easy they are to slash and pivot on a dime or to put on edge and carve on groomers, shallow powder or chopped powder. They are way more stable than they should be for their weight. I haven’t skied them on very firm or icy snow yet, but on everything else I love them! We’ve had deep blower pow here the last few days and in technical terrain indeep snow these skis are amazing. Mostly they are just easy to ski yet strong enough to carry speed through deep chop. Plenty of float too. Great review Paul. I’m wondering if you have had an opportunity to ski the Volkl BMT 94? I absolutely LOVE my BMT 109/Kingpin setup, and now I thinking of getting the BMT 94 with a lighter binding (g3 Ion?) for spring skiing. All of my ski partners are on lighter setups and its very tempting to drop a couple pounds. Wondering if the most characteristics (besides width) of the 109 are retained in the 94? Hi Michael, Thanks for reading! I have not had the chance to ski the 94 yet but I think your idea is a good one. I’ll try to get a pair this year if possible. Best of luck and have a great winter. Great review. I love these skis. Do you have any suggestions for decreasing snow and ice buildup on the black top sheet? I have used a silicon spray on the topsheets. Wax, rain-x something like that. I believe it helps in warmer temps or when the sun is out when the snow might melt and refreeze and stick to the topsheets. Snow buildup in colder temps and cloudy days seems to be no worse than my friends skis with lighter topsheets. Wish they didn’t have the 10cm spacing between ski lengths! I’d jump for a 181-ish without second thoughts… so I’m 5’9″ 165lb, skiing in Vulcans, would probably put G3 Ions on these. I had some 178 Nunataqs that were a perfect length for b/c, but I blew them up if I really pushed them on-piste. I’m assuming the BMT 109s are a bit stouter and losing 2cm wouldn’t be too much of a change for 80/20 backcountry/piste? (piste being Highlands Bowl, Snowmass, Telluride) I’d be good with the 186 BMTs on-piste, but a little concerned about kick-turns and not enough speed to really drive them on most b/c days when higher speeds just aren’t happening. Upper 170’s seems to be my sweet spot for b/c, mid-low 180’s for on-piste. Bottom line is I think I’d be good with the 176 BMT 109s if they managed things at speed at least as well as the 178 Nunataqs. Thoughts? Christian, I am the same height and weight as you. I’m on the 176 109’s with Scarpa F1 boots and Vipec bindings. While there may be a few times when I wished for the 186’s, I would choose the 176 for 80% backcountry every time. The 176 is a great balance of uphill vs downhill. I’ve never wished that I was on the 186 during a steep climb in the trees :). My Volkl BMT 109’s are mounted with Fritschi Diamir Vipec bindings. The topsheet says “marker only” but I have not had a problem with the Vipec’s. I used epoxy on the binding screws. All screws went in solid and have held tightly. How does the ski compare to Navis Freebird when it comes to stiffness? Can you push the skis in short turns on hard groomers without sideways skipping? Somebody knows if Volkl is going to change something on this ski for season 2018-2019? Do you think there’ll be a ski this season (2018-2019) which will be better than this one? It’s hard to believe that a ski from 2015 can still compete with brand-new ski from 2017 or 2018. I am wondering whether I should buy the 2017/18 or an older (cheaper) 2015/16 model from this ski. It seems not have change-except for the cover design. Does anybody know wheter the 15/16 version also had the “Ice-Off” Topsheet? As there seems to be some issues with sticky snow at the topsheet of this ski. I’m 178cm tall and my choice on this ski would have been the 176cm, not the 186cm which is bigger than me. I am 176 cm and weigh 75kg. The 176 BMT gives me plenty of float. I would not want the added length and weight of the186 BMT for backcountry skiing. I’m 5’9” and 155lbs …. i ski The BMT109 in 176 with G3 Ion … even with a loaded avy pack , I never felt the need for a longer length in backcountry conditions ….and kick turning a 186cm for me would add unnecessary difficulties on steep turns … never wish a longer length for extra float or stability in Backcountry conditions … and I skied it a few times on Rogers pass on deep days … but that’s just me …. ohhh and I absolutely LOVE this ski … it handles everything I skied so far …. 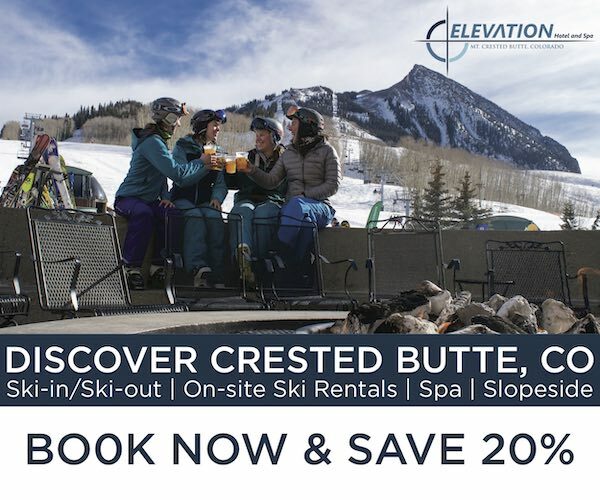 it’s a fun ski and easy ski as well…. I find it very well balance for my style …. I bought a pair of these last summer when I saw them offered at 50% off at my local ski emporium… the idea was to put them in the cellar until my current back country / touring set (K2 Coomback/Kingpin) were worn out.. I had them fitted with a set of Tecton12 bindings. Took them out for a couple of days just to see what they were like..fell in love.. skied pretty much the whole of the season on them. These are awesome skis, light, really easy to pivot but still able to hold an edge. I ski mostly in the 4 valleys area so get a real mix of conditions. I ski the 186, weigh 190lbs, 6’1″, Scarpa Maestrale RS. So…. does anyone want to buy some Coombacks fitted with Kingpins…. I liked them so much I bought the 122 as well…. Do you have any experience with skiing BMT 109s back from boot center? I had mine mounted on the line (vulcans and tectons), & absolutely loved them. Its been firm conditions since the boot change, so not sure if im just imagining the difference in feel. Is 7mm actually likely to make a real difference, or am I just crazy? In general, Volkl Skis hate being mounted back of centre, for all the reasons you describe – I had a similar thing happen with a set of Katanas, ended up 10mm too far back, had to get them re-drilled. Forward of centre will just make them a bit more playful. What about the forward lean angle on the new boot? I would think a little more forward lean would compensate for 7mm. Also, maybe the new boots aren’t as stiff? My BMT 109’s are mounted about that much behind the line and I think there is a slight loss of turn initiation. Could be my imagination, but its nothing that driving the boot a little more won’t overcome.